Parasites, or Guess Who's Coming to Dinner? They receive their nutrients and shelter from their host(s). So besides just taking the best of your nutrition, they also leave their wastes for the host (YOU) to deal with. If you think that parasites are only a problem to humans in Third World countries, you would be wrong. Good sanitation is great prevention, but the Earth is becoming a very small place. With increasing mobility of the world population (pleasure vacations, soldiers going to wars, and refugees being adopted into new countries), many kinds of infection, including parasitic infection, are being passed around unwittingly. Roundworms – Depending on the species, roundworms can grow – in the human intestinal tract – to be as big as a pencil. 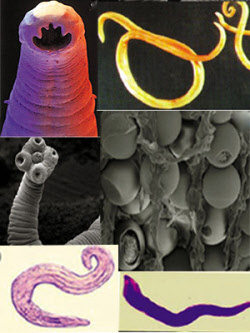 Tapeworms – Long, flat, and ribbon-like, tapeworms break into segments and are easily spread through animal feces. Flukes – Humans usually become infected with fluke parasites from eating raw or undercooked seafood, infected vegetation such as watercress and water chestnuts, or drinking or wading in infested water. Single Cell Parasites (Protozoa) – Microscopic protozoan “cysts” are found practically everywhere, and cause a myriad of diseases; yet a strong immune system can easily resist them. Spirochete – True to its name, a spirochete is a spiral-formed creature with attributes of a bacteria, and includes Treponema, the cause of syphilis. Symptoms of parasite infection include chronic gas and bloating, always tired or hungry, unclear thinking (brain fog), allergies, chronic anemia, always drowsy after meals. Watch for children picking their nose, scratching their bottom, or grinding their teeth at night. All are symptoms of parasite infection. There are many ways of preventing parasitic infection, good sanitation and hygiene are probably the easiest and the most important. If you will be in an area where you’re unsure about the water supply, bring hand sanitizer and bottled water to drink and for brushing your teeth. Don’t swim or wade in stagnant water, especially if the weather is warm or hot! Make sure not to get constipated. Constipation invites parasites. Keep your skin at a slightly acid pH. After bathing with soap, which is usually alkaline, moisten a washcloth with a mixture of 1 Tablespoon of apple cider vinegar to 3 Tablespoons of water, and run it lightly over all your body, to bring your skin’s pH down a little. Or you can spritz this mixture from a spray bottle as an after-bath toner. Two drops of sassafrass oil on the sole of each foot once a week can keep blood and lymph parasites away (do not take sassafrass oil internally). Beneficial foods include raw pumpkin seeds, Calmyrna figs, garlic, raw apple cider vinegar, cranberry juice, and pomegranates (eat the seeds, too). Avoid raw or undercooked meats: beef, pork, fish and other seafood, or poultry, sugar and refined carbohydrates in general, untreated water from even pristine-looking springs or rivers, raw water chestnuts or water cress, and un-washed (or washed in questionable water) fruits and vegetables. A high carbohydrate diet may make a parasite infection even worse. Download Basic Parasite Cleanse Instructions for printing. Does your pet have parasites? We love ’em, but pets are one of the ways WE get infected. Take care of the ENTIRE family with these safe, herbal remedies for pets. Nobody enjoys talking about Spiritual Parasites; is this for real?